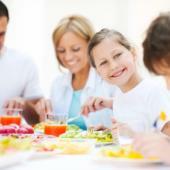 By the time most children are in elementary school, they know the basics of healthy eating. But whether or not they actually have good eating habits depends on what is learned and practiced at home. Healthy, or unhealthy, eating habits are established very early in life and can indeed set the stage for how healthy we are as we age. According to the World Health Organization, childhood obesity is one of the most serious public health challenges of the 21st century. The concern is global and is steadily affecting many low and middle-income countries, particularly in urban settings. Worldwide, in 2010, the number of overweight children was estimated at 42 million, with 35 million of those children living in developing countries. Two factors are to blame: a shift in diet towards more energy-dense, nutrient poor foods and decreased physical activity levels. Children who are overweight or obese tend to carry this condition into adulthood, as well as develop diabetes and cardiovascular disease (heart disease and stroke) at younger ages. Overweight adults are also at greater risk of musculoskeletal disorders (such as osteoarthritis) and certain types of cancer (breast, colon and endometrial). Because the prevalence of childhood obesity has increased at alarming rates, the current generation of children and adolescents may be the first to have a shorter life expectancy than their parents. Improved eating and activity habits can reduce risk of chronic degenerative diseases, including cardiovascular disease, type 2 diabetes, cancer, obesity and osteoporosis. How can we establish the healthiest of habits in our families and thus reduce our risk of disease? Below are some tips for success. Be a positive role model for your family when it comes to food choices. Eat a variety of fruits, vegetables and whole grains every day. Choose lean meat or other proteins and low-fat dairy foods. Think of your dinner plate as a pie chart: ¾ of the plate should be plant foods (fruits, vegetables and whole grains). For the remaining ¼, choose lean meats or other proteins and low-fat dairy foods. Encourage healthy snack foods. It is often difficult for a child to get their daily nutrition requirements in three meals. Think of snacks as mini-meals. Choose from fresh or dried fruit, low-fat yogurt, air-popped popcorn, vegetables with low-fat dip, rice cakes, whole grain cereals and low-fat milk, or whole grain crackers or toast topped with fruit spreads, nut butters or low-fat cheese. Texture and size of food pieces should be age appropriate to prevent choking. Be active as a family. Children and adults need 30 to 60 minutes a day of physical activity. Play sports, ride bikes, go for walks or play active games. Establish regular meal times as a family. Irregular meals may lead to increased snacking, and children being less hungry at meal times. Eat together as a family as often as possible, at least once a day. Strive to make meals a time of pleasant conversation. Ban arguing and scolding at the dinner table. Limit time spent watching television and playing sedentary video games. Always eat breakfast, especially during the school year. Breakfast provides fuel for the brain and learning. Involve children in meal planning. Try to guide their choices rather than dictate them. Set standard patterns such as having at least one vegetable, one fruit and one whole grain choice at each meal. Then let your child help make the choices. Involve children in grocery shopping, teaching them how to choose the best produce, how to read food labels, how to compare pricing, etc. Challenge them to find new healthy foods to try often. Let children assist in food preparation, as appropriate for age. Even toddlers can “help” add ingredients and stir, giving them a sense of accomplishment and pride. Children may be more likely to eat foods that they helped to prepare. Encourage children to eat slowly. Our bodies can better detect hunger and fullness when we eat slowly. Eliminate or limit sugary beverages such as soda or fruit drinks as these are high in calories and offer little or no nutritional value. Encourage water or milk (nonfat or 1% after age 2) with meals and water with snacks. Limit fried foods and added fats such as butter, margarine and oil. Discourage eating while watching television or using a computer. Eating while doing other tasks can lead to an association between two activities, this can in itself lead to overeating. Eating while engaged in other activities can also lead to “mindless” eating, which may distract from feelings of fullness. Limit eating to the kitchen or dining room table. Don’t insist that children clean their plates as this can actually lead to overeating and food aversions. A good rule of thumb on portion sizes for small children is one tablespoon of a food per year of age. Start there and let children ask for more if they are still hungry. Don’t expect a child to taste an unfamiliar food the first time it is offered. It may take multiple times of seeing a particular food before they actually want to try it. Encourage them to try at least one to two bites, but don’t force them to. If your child purchases lunch at school, become familiar with the school’s lunch program. Most schools are required to provide well-balanced meals, but what is your child actually choosing to eat? Know the daily menu choices and offer a healthy sack lunch as an alternative. Good nutrition and healthy habits start at home. Modeling good food choices, eating styles and activity levels can set the basis for a lifetime of healthy habits and healthy bodies. If your family has a long way to go in changing habits, try doing so gradually. Make one or two changes at a time, giving the family a few weeks to adjust. Point out the positive benefits such as feeling better and having more energy. And prepare foods in your Saladmaster® healthy cooking system to ensure that you and your family receive the maximum benefit from your meals. Remember that living a healthy life is a journey, not a destination. Enjoy the trip!